via Capricorn Zodiac Sign iPad Design from Zazzle.com. 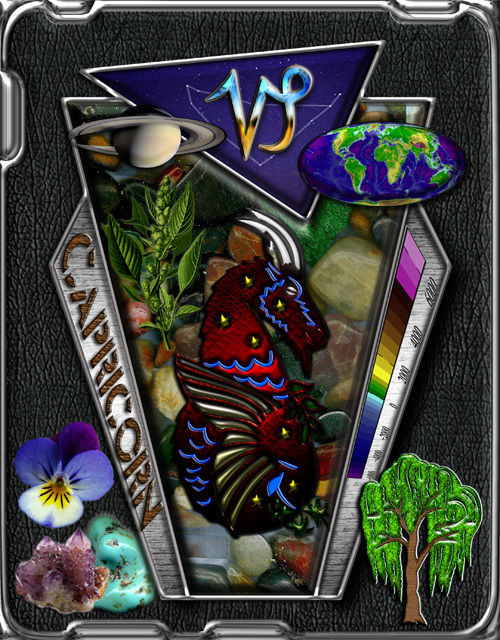 Capricorn Zodiac Astrology Sign & Symbol Sea Goat (Goat with Fish Tail) Artwork Characteristics Elements Shown Tree, Willow, Flower: Heartsease, Amaranthus, Color Dark Gray Elephant Skin Background and Dark Brown Word Art, Gemstone, Turquoise and Amethyst, Zodiacal constellation called Capricornus of the southern hemisphere shown in Top Framed in Triangle Capricorn is Classified as an Earth Sign, The Large Framed Triangle Background Is Made of Gemstones for This Reason, and I Have Included An Image of The Earths Topography With a Color Chart in Meters, Which Goes From -6000 -4000 -2000 0 2000 4000 6000 and its ruling planet is Saturn Shown Here In Cassini Orbiter Photo Taken On 10-06-2004. Great Gift for Anyone Born Between December 22nd – January 19th.